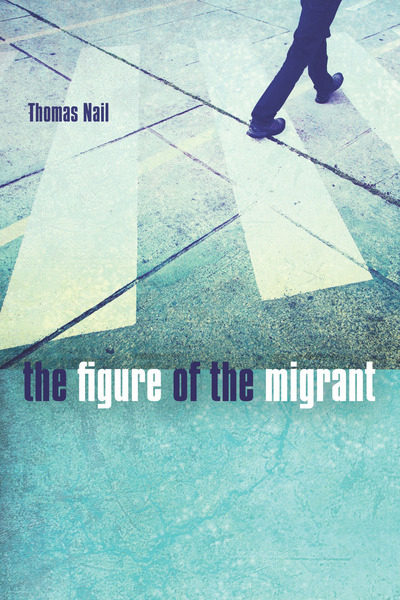 A few weeks ago I saw on Stuart Elden’s Progressive Geographies blog that Thomas Nail’s The Figure of the Migrant was being released in early October. I snapped it up as soon as I could. Nail’s Figure of the Migrant attempts to provide a counter-history of the migrant by prioritizing movement. Most historical accounts of tourism, vagabonding, migrancy, and refugees begin with the assumption that populations tend to be localized and stable; migrant movement, in this traditional reading, is then read as an accidental offshoot of how humans tend to communalize. Migrants are nothing more than “failed citizens”. This state-first, migrant-second approach views in purely negative terms. And so Nail attempts to re-read that history from a positive point of view. To do that he offers a new theoretical scaffolding, what Nail calls “kinopolitics”. This “social theory of movement” begins with the assumption that human groups function first and foremost as “flows,” that is, as a continual movement (think hunter-gatherer strategies). From there he layers concepts that explain how bustling energy of human flows become ordered and controlled: by junctions (“redirection of a flow”) and “circulation” (connections of junctions into “larger curved path”). It’s only when junctions & circulations manage flows in accordance with ancient power centers (such as temples, later palaces) that flows territorialize the earth and its resources, domesticating Nature and other homo sapiens. Emerging territories are sustained in turn by “centripetal” (circulating resources towards the center) and “centrifugal” (expelling unwanted detritus outwards) energies. According to Nail, this territorial ordering is what produces the migrant, which varies over time but remains the expelled other. The centripetal concentration of agricultural communities expel a certain untamed percentage to beget the nomad; empire begets the barbarian; feudal power begets the vagabond; and modern liberalism (market-driven governments) begets the proletariat. That’s not to suggest each migrant figure only appears at that circumscribed historical period. Nail interprets refugees as contemporary barbarians, for example. What lends the quatrain a common leitmotif is that, due to carefully orchestrated expansions and circulations, a remnant is forced to flee. Although the migrant isn’t helpless. Nail pointedly argues the movement is a mixture of compulsion and self-direction (ancient migrants expelled from middle eastern agricultural communities, for example, strategically headed for the steppes, establishing a nomadic way of life). But either way this mixture is enough to separate, e.g., the vagabond from the tourist. Yet it’s in these finer details that I start to wonder whether Nail might need to be supplemented with a theoretical framework that’s used to working with theological traditions. The Figure of the Migrant is all about movement. The first historical instantiation of the migrant is the nomad. And yet there’s an entire theological tradition devoted to mythic expulsion that Nail never even hints at. He does refer briefly to Yahweh’s preference for the nomadic Cain rather than the agriculturally-minded Abel; but this allusion only draws attention to the fact that the original mythic expulsion–Adam and Even from the garden–is never explained in “kinopolitical” terms. Furthermore, the most famous polity from the medieval period–Augustine’s City of God as a floating ark moving precariously towards a higher world—doesn’t seem to have a place within the dualism Nail sets up between migrant flows (such as nomads on the steppes) and territorial concentration (such as ancient Sumer). Perhaps Nail would argue that the ark, like the city, is spherical with centripetal circulations; but the Church body within the ark isn’t setting down roots on terra firma. If anything it’s supposed to launch off at some point. Doesn’t Stuart Elden’s The Birth of Territory show that the medieval City of God departs from Roman territorialization? How would Nail account for this body politic that fits somewhere between Roman and feudal territory? And the most common figure representing movement in the same period–the pilgrim–doesn’t appear in The Figure of the Migrant. In Denise de Rougemont’s Love and the Western World, pilgrims and their chivalrous offshoots are driven more by compulsion than by choice. This seems to align them more with vagabonds than tourists. Where do the otherworldly and (sometimes) anti-territorial movements of non-expelled figures belong? Do pilgrims “become migrant” if they occasionally work against centripetal forces? In other words, what seems to be missing in Nail’s otherwise amazing contribution to geographical studies is a fine-tuned scale that accounts for anti-territorial movements that fit somewhere in between “good citizens” and “migrants”. There’s certainly space in his account for such figures, but The Figure of the Migrant leans towards an either-or scenario. Either migrants challenge the status quo or everyone else resides contentedly as a peaceful citizen. As with most dualisms, the payoff is normative: by suggesting one is either a citizen or an excluded migrant, Nail valorizes the latter as the secret to civilization that needs to be recovered. Migrants are Deleuze’s universal minority that flees entanglement and stasis. – Nail, Thomas. The Figure of the Migrant. Stanford: SUP, 2015. Ebook.